The lumber market has officially reached “rally” status as commodity wood prices surged off a low not seen since late 2011. Contract Lumber’s Commodity Lumber Price Index has registered solid gains in each of the last six weeks as the initial strength of OSB has now carried over into all product categories. In part, this rally may have its origins in dealer’s cautious attitudes toward taking inventory positions as the market grinded lower through June, July, and August. Many couldn’t help but think cheap lumber was going to be readily available throughout the remainder of the year so why buy for anything other than basic needs with inventory’s “day of reckoning” staring them down. But the lumber market has a way of eventually making liars out of us all, and if not liars, then fools certainly. And in this case, a lot of dealers were fooled. Of course, also in the back of lumber buyers minds was the expiration on October 12th of the Softwood Lumber Agreement (SLA) which eliminated a 15 percent tax to Canadians for the export of their wood to the U.S. Fear of a “wall of wood from the North” that would flood the market kept some buyers on the sidelines to see how it all played out. Well, how it played out, at least in the short term, is that lumber markets shot up 14 percent while they waited and many are left scrambling to cover year end needs at levels they never anticipated. Keep in mind, everybody is busy right now. Many have sold multifamily projects well into 2016 and beyond. Residential home building activity has been steady and fluid. Managing inventory may seem like a simple process in such favorable conditions but it becomes more complex than many think. Storage, whether inside or out, is often a concern for inventory managers. Keeping fresh, bright, clean, dry stock is a challenge for all levels of distribution as is added cost when you are forced to land wood into reload and storage facilities. We’d all like to have acres and acres of unlimited under-roof storage at our disposal to take advantage of buying opportunities but that is seldom the reality. Buyers are often constrained by available credit limits, mill contracts, and customer’s allegiance to specific branded goods. None of us ever has enough “cheap” inventory when the market is soft and we’ve all been caught with overpriced wood when the market heads south. The result is distribution inventory levels built more for “just-in-time” or flexible strategies rather than “loading-up” mentalities. Of course, playing inventories “close-to-the-vest” can promote more pricing volatility as when dealers, fearing a blip could turn into a spike, jump into the fray and add fuel to the fire. The 2015 lumber market experienced roughly 15 percent more volatility than the two years prior where a $30 price swing was the extent of any instability. The lumber market softness in the face of robust building activity in the first half of the year can be traced to a modest increase in domestic lumber production, a stronger increase in lumber imports, and a significant decrease in wood exports. There was nearly a billion board feet more wood for the U.S. market to absorb through the first six months of 2015 putting downward pressure on wood prices. But most wood products producer earnings took a hit, especially in the second quarter, and many mills starting drawing down production to get more in line with demand. 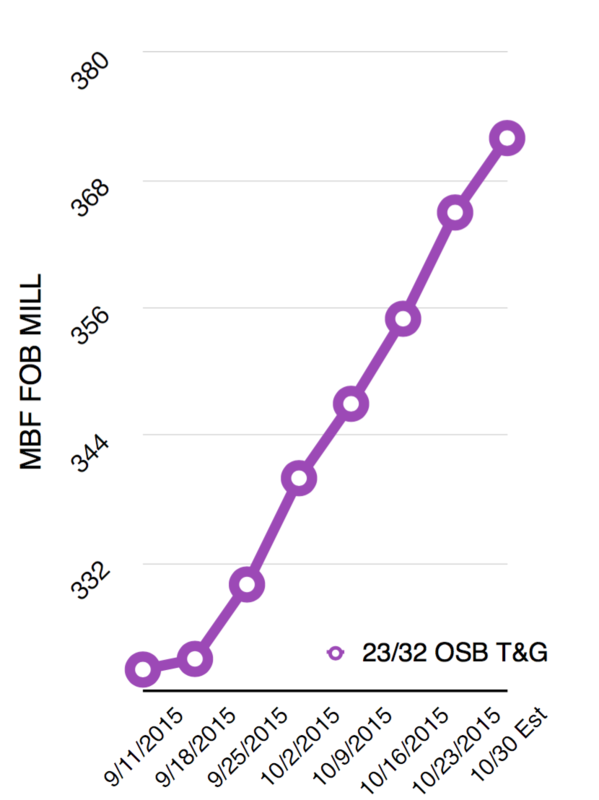 Many analyst believe that’s how OSB mills finally strengthened their position after bleeding red ink the past five years. Only time will see how it plays out, especially as the industry braces for whatever fallout, if any, the expiration of the SLA will have. The housing industry seems to be humming along albeit month to month data points can cause some consternation. But if you keep a longer term perspective, say year-over-year comparisons, the recovery seems to be picking up steam. Multifamily housing continues to be the shining star, propping up housing start activity to a seasonally adjusted annual rate of over 1.2 million units in September. Apartment construction increased 18.3 percent to 466,000 units while single-family edged up ever so slightly to 740,000 units. Analyst are cautiously optimistic with the performance of the single-family market siting a gradual improvement throughout 2015 up over 11 percent. Chief economist, Brad Hunter projects similar gains in 2016 and 2017 for single-family housing siting a strong job market and continued low mortgage rates as a catalyst for growth. He also expects the pent-up demand of entry level buyers, who have been conspicuously missing and largely ignored by many builders in the initial recovery period, to strengthen in the coming two years. NAHB Senior Economist, Robert Denk agrees that the numbers are firmly behind these projections. Since 1990, the average number of single-family starts per year is 1.3 million. He is projecting 1 million single-family starts in 2016 and 1.2 million the following year, still only 91 percent of the average. Of course there are significant challenges impeding these more robust recovery expectations. Two of the most significant include a shortage of available lots and a shortage of available labor. Many builders complain that a housing lot shortage has definitely stymied home sales. Developers blame restrictive regulations, limited financing for lot development, and buyers growing preference to live in or near cities where little unused land exists. Stringent Federal environmental rules and local government meddling requiring impractical “pay-to-play” scenarios can delay or scuttle projects and have become prevalent as the improving economy reduces local officials’ need for tax revenues that new development brings. In a recent NAHB survey, developers claim that regulatory requirements have added seven-months to the development process. But in the end, it may be labor that decides just how the housing recovery plays out. Construction industry employment tanked along with housing from 2006 to 2011, losing nearly 2.3 million jobs. We’ve gotten well less than half of those back and many builders, especially large production companies, say that labor woes are making it difficult to deliver sold homes on time and on budget and many have down-graded their sales projections for the year. In a recent NAHB survey, nearly three-quarters of the builder’s surveyed reported that availability of labor was a significant problem in multiple trades and it was hindering them from completing units. Some argue that builders have done it to themselves by not rewarding tradesmen with a reasonable compensation structure. NAHB recently noted that residential construction workers were paid, on average, 14 percent more than the overall U.S. average wage in 1990. By last year, that premium had shrunk to 4 percent. And it may not be a fixable problem by just throwing money at workers to lure them back. John Burns Real Estate Consulting conducted a recent study that revealed many of the Hispanic workforce who had been majorly responsible for the constructing of America, left the country during the real estate crisis. Many of them have not returned to work in the U.S. due to tighter immigration controls – both for those entering legally and those not – and comparable job opportunities in some Mexican states with improving economies. For some of the earlier housing projections to come true, our industry will most assuredly need to attract a new wave of tradesmen to get the job done. In general, there are many more positives than negatives facing the building industry right now and overall consumer, builder, and lumber dealer confidence are strong heading into the traditional construction slowdown period. The United States Census Bureau’s “population clock” may be the best indicator of what lies ahead. The population clock says that there is 1 live birth every 8 seconds in the U.S. There is also 1 death every 12 seconds. Additionally, 1 international immigrant arrives in the U.S. every 33 seconds. The net impact is that two – three million additional residents live in America every year and shelter is one of the most basic needs they will require. And guess who gets to fulfill that requirement – you and I.